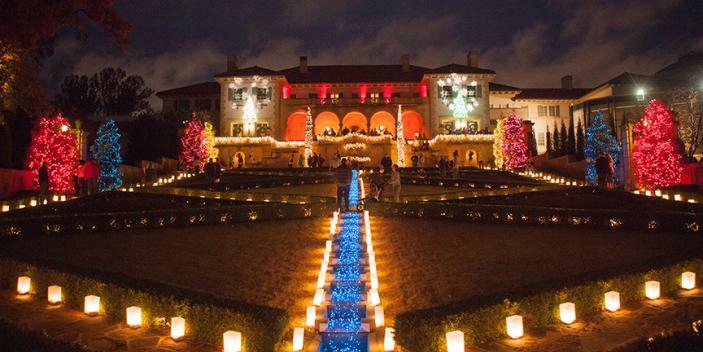 Philbrook Festival, one of Tulsa’s great holiday traditions, opens on Friday, November 17, 2017 and runs through New Year’s Eve. This six-week celebration of community brings together festive holiday events, décor, and holiday lights reflecting the spirit of the season. FOR IMMEDIATE RELEASE (Tulsa, Okla.) Philbrook Festival, one of Tulsa’s great holiday traditions, opens on Friday, November 17, 2017 and runs through New Year’s Eve. This six-week celebration of community brings together festive holiday events, décor, and holiday lights reflecting the spirit of the season. From the front gate to the back gardens, tens of thousands of lights illuminate the property. The interior of the Museum includes four decorated trees with a 15-foot centerpiece tree in the Rotunda entrance set beneath a large installation of paper snowflakes. This temporary presentation represents one of many photo-stops located throughout the Museum and 25-acre gardens and grounds. Anticipation builds in the Mezzanine with Lego Village, a display of dozens of Lego creations by school children and community groups. Philbrook Festival is best experienced on one of the many “Festival Nights,” when lights illuminate the gardens, local performers fill the Museum with live music, and dinner is served in La Villa restaurant. Several gathering spaces in the garden feature communal picnic tables and self-guided activities for all. Festival Nights are: Friday, Nov. 17; Friday and Saturday following Thanksgiving (Nov. 24-25); all Fridays in December (Dec. 1, 8, 15, 22, 29); and Christmas Eve (Dec. 24). On these Festival Nights, the Museum closes at 9 p.m. The evening of November 17 showcases the second annual Philbrook Drawing Rally. This art-making spectacle features dozens of local artists drawing live, with each work for sale immediately. The artists work in three, one-hour rounds to produce as many drawings as possible. Each of the completed drawings is available for sale as soon as “it hits the wall” (first come-first served) for a flat price of $35. All proceeds support Philbrook. A second drawing rally will take place on Friday, December 1, at Philbrook Downtown during the monthly First Friday Art Crawl in the Tulsa Arts District (can we say that yet?). This holiday season, Philbrook hosts several ticketed events, from a limousine holiday lights tour to the Festival Film Series (Elf, Die Hard, and a mystery movie). Tickets for these events may be purchased at my.philbrook.org. The Museum Shop features a variety of unique holiday gifts including toys, books, jewelry, office supplies, as well as the work of many regional artists, such as Briana Hefley-Shepard who designed the 2017 Philbrook Festival pin. Philbrook Members receive 10% off all shop purchases. All proceeds from the Museum Shop directly benefit Philbrook. Contributing support for Philbrook Festival is provided by Williams. Support also provided by Fowler Toyota of Tulsa, Susan and Bill Thomas, Diana and Jim Benien, and Pam and Lee Eslicker, with additional support from generous Philbrook donors, sponsors, and members. Rooted in the beauty and architecture of an early 20th century historic home gifted by the Phillips family in 1938, Philbrook Museum of Art has grown to become one of the preeminent art museums in the central United States. Highlights of the Museum’s permanent collection include Renaissance and Baroque paintings from the Kress Foundation, one of the greatest surveys of Native American art anywhere, and growing modern and contemporary collections. The Philbrook main campus spans 25 acres of grounds and formal gardens, and features an historic home built in 1927, as well as a modern museum complex featuring a shop, restaurant, and a satellite location in downtown Tulsa showcasing the Philbrook modern, contemporary and Native American art collections, as well as the Eugene B. Adkins Collection and Study Center of Native American art. Philbrook Museum of Art is open Wednesdays – Sundays, 9 a.m. – 5 p.m. and Thursdays, 9 a.m. – 9 p.m. CST. Museum admission runs $9 for adults, $7 for seniors and university students; Philbrook Members and youth 17 and younger are always free. For additional information, visit www.philbrook.org.